1.Is the world milling industry growing? The capacity of the milling industry is slowly growing. This growths appears to be mostly due to the growth of the world population. Only in a few regions, particularly in Asia, the consumption of wheat flour is also growing. In contrast, the number of mills is decreasing due to mergers and increasing capacities of new mills. 2. Does the particle size of the flour influence the effect of the enzymes? The finer the particle size, the larger is the area that can be attacked by the enzymes. Moreover, the constituents of the flour hydrate faster, and this makes them more readily accessible to the enzymes, because a fine particle size is often accompanied by greater damage to the starch (although this is not necessarily the case). The damaged starch grains already swell in the dough and are thus available to the amylases. Intact starch grains are not. 3. Which particle size is better -90 or 150 microns? That depends on the properties you want the flour to have. 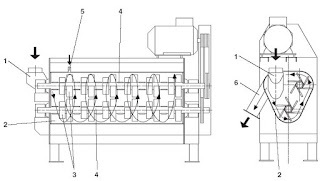 Smaller particles usually mean more damage to the starch if the small size was achieved with ordinary cylinder mills. This results in greater water absorption and better breakdown by enzymes and yeast, but also reduced stability of the dough. In coarser flours there is not only less damage to the starch; the larger particles also swell more slowly, with the result that the doughs stiffen subsequently and thus become more stable. 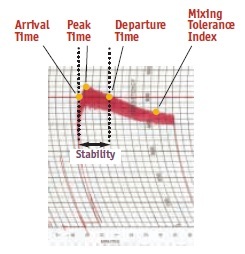 Coarser flours also cause less dust and have better flow properties. 4. How does the milling yield (extraction rate) affect protein and ash? Is there some correlation between the protein and ash content of flour? Endosperm protein and the mineral content decrease from the outside of the kernel to the centre. At higher extraction rates, the amount of the aleuron and outer endosperm layers is larger than in flour from low extraction rates. This means that ash and protein increase with the extraction rate. They are both correlated to a certain extent. 5. Why should the germ be removed from the kernel before milling? Why is there a difference in shelf-life between white flour and whole meal flour? The germ contains about 10% lipids, mostly unsaturated. The milling process would destroy the structure in which the lipids are bound, exposing them to atmospheric oxygen. Rapid oxidation (both enzymatic and non-enzymatic) and thus rancidity would occur. 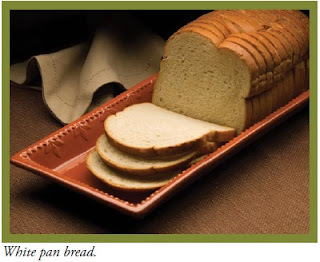 Whole meal flour containing the wheat germ is therefore less stable than white flour. 6. Why does flour from the wheat of a new crop/harvest display different attributes from those of flour from wheat that has been stored for several months? Maturation of flour is a natural process caused mainly by exposure to atmospheric oxygen. In almost all cases freshly milled flour has a much poorer performance than flour stored for 2 weeks. 7. Is there any way of adding chemicals at the tempering stage, i.e. some water-soluble type, to achieve a whitening effect? There have been partially successful attempts to improve the removal of the bran by adding enzymes to the soaking water, which would result in a brighter colour of the flour. The author is not aware of any trials with oxidizing substances such as chlorine, benzoyl peroxide or hydrogen peroxide. The use of oxidizing agents might have some effect on the colour, but access to the carotenoids of the intact kernel is probably limited, so the approach would not be very effective. 8. Why does the volume yield fall as the degree of extraction increases, although the protein content rises with higher extraction? The proteins of cereal are unequally distributed over the layers of the grain. 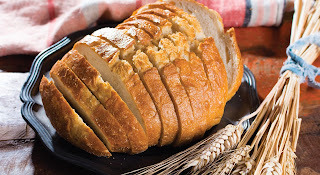 The water insoluble protein fractions glutenin and gliadin that are important for baking are mainly in the endosperm, whereas the aleuron layer, although rich in protein, contains mainly water-soluble proteins that do not improve the baking properties.